← The Sports Archives – Top Five Sporting Scandals! Many years ago, I traveled to Perris, CA for the National Skydiving Championships. My husband at the time was competing in a 20-way formation competition. When we arrived and signed in we had to fill out an extensive release form and then sign it on video while reading aloud “Hi my name is… I am signing away my right to sue you if I do something reckless.” Drop zones had become so concerned about being sued by a skydiver’s family that they had to amend the waivers. My parents are Canadian; we don’t sue up there. Still, I called and told them that they must never, EVER, try to hold someone else accountable for my stupidity or risk-taking! Can we Govern Ourselves Accordingly? Apparently we can’t be trusted to do the right thing, ever. Of course, society needs rules but why make BASE jumpers into outlaws? Do they ever harm anyone but themselves? Instead of wasting resources chasing and arresting them, it would make more sense to make them accountable. If, for example, you jump off an antenna and get caught in the wires you should have to pay for your rescue and any damage you do to public property. Why waste time and energy trying to prosecute someone for that ? Surely seeing photos of themselves, hanging like a Christmas tree ornament, publicly posted on Facebook should be punishment enough. How can it be OK to throw yourself out of an airplane bareheaded but not be OK to ride a motorcycle without a helmet? When I started skydiving, I wore a silly leather frappe hat. I felt goofy, but it’s what most people wore to protect their heads, though many only wore goggles. The first time I caught an elbow to the temple on and exit and saw stars, I bought a real helmet. I understood immediately that I needed to be conscious to open and fly my canopy. There is no law requiring it, though obviously skydiving helmets save lives. I have never ridden a motorcycle without a helmet though I’ve had plenty of opportunity while riding in areas where they are not required. I’ve fallen on my head dozens of times and even in full dirt riding gear have managed to leave skin on the motocross track, so I fully understand the value of safety gear, but I don’t get making it a law. Same thing for seat-belts. I always wear one, but when I lived in Guatemala there were often more people than seat-belts in the car, no car seats for kids, children on laps in the front seat. When you drive down the road with kids loose in the car and go by a little motorcycle with a family of 6 on board it’s just business as usual. You don’t question whether the parents are irresponsible, or should pay a fine. It’s the only way they can get from point A to B. In fact, when several cities in Guatemala instituted a law prohibiting more than one person on a motorcycle, we rode in the protests for several weeks. The bottom line is we must not take the freedoms we have for granted. Pretty soon it could be illegal to wear shorts because pants have been proven to be 90% effective in preventing skinned knees! 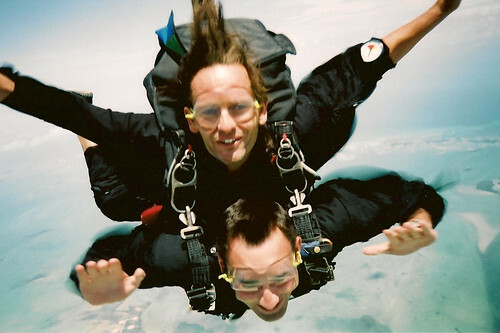 Gareth Smith is an adrenaline-junkie and general thrill seeker who works as a soccer coach in Nashville. He has also developed a writing hobby and often uses a grammar checker to proof his work before letting anyone read it. He still keeps in touch with him family in Blackpool thanks to his international calling cell phone. This entry was posted in Other and tagged athletics, base jumpers, Base Jumping, danger, Extreme Sports, law, litigation, MotorCycle, risk, Sky Diving, skydiving, tips, tips and tricks. Bookmark the permalink.